G4J Connect:Leeds – The debrief! 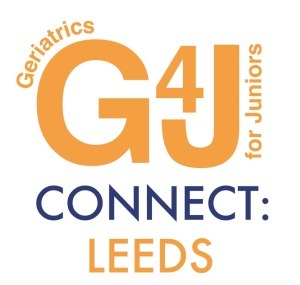 Despite the wintry weather and forecast of snow there was an excellent turn out for the first G4J Connect:Leeds event at St. James’s University Hospital. The evening kicked off with a rapid-fire overview of syncope by Dr Brierley, a consultant geriatrician and head of the renowned syncope service in Bradford. This was followed by some wise words on being a medical registrar from the Fresh Prince, Dr Sean Ninan, and an overview of the range of out of programme experiences undertaken by geriatric medicine registrars by Dr Rebecca Anthony – both geriatric medicine registrars in Yorkshire. Dr Heseltine, a geriatrician with a specialist interest in movement disorders, gave an inspiring talk on Parkinson’s Disease for Juniors covering key tips for junior doctors and delved into what a Parkinson’s disease service might look like. The event was rounded off by Dr Gillian Fox, consultant geriatrician in Leeds, speaking about interface geriatrics and sneaking a peek at what the future might hold for joined up health and social care services. The feedback was extremely positive and future events are already being discussed. If you’re an current or aspiring Geriatrician in the Yorkshire area, follow @MedEldYorkshire on Twitter to keep up to date.